This fix is the beginning to creating a coupled FE/MD simulation and/or an on-the-fly estimation of continuum fields. The coupled versions of this fix do Verlet integration and the post-processing does not. After instantiating this fix, several other fix_modify commands will be needed to set up the problem, e.g. define the finite element mesh and prescribe initial and boundary conditions. # specify the initial values for the empirical field "temperature"
Note coupling and post-processing can be combined in the same simulations using separate fixes. No information about this fix is written to binary restart files. The fix_modify options relevant to this fix are listed below. No global scalar or vector or per-atom quantities are stored by this fix for access by various output commands. No parameter of this fix can be used with the start/stop keywords of the run command. This fix is not invoked during energy minimization. the FE computations are done in serial on each processor. After specifying this fix in your input script, several other fix_modify commands are used to setup the problem, e.g. 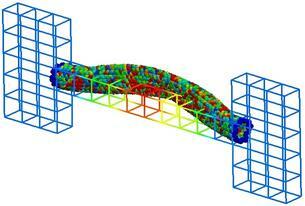 define the finite element mesh and prescribe initial and boundary conditions. (Wagner) Wagner, GJ; Jones, RE; Templeton, JA; Parks, MA, “An atomistic-to-continuum coupling method for heat transfer in solids.” Special Issue of Computer Methods and Applied Mechanics (2008) 197:3351. (Zimmerman2004) Zimmerman, JA; Webb, EB; Hoyt, JJ;. Jones, RE; Klein, PA; Bammann, DJ, “Calculation of stress in atomistic simulation.” Special Issue of Modelling and Simulation in Materials Science and Engineering (2004), 12:S319. (Zimmerman2010) Zimmerman, JA; Jones, RE; Templeton, JA, “A material frame approach for evaluating continuum variables in atomistic simulations.” Journal of Computational Physics (2010), 229:2364. (Templeton2010) Templeton, JA; Jones, RE; Wagner, GJ, “Application of a field-based method to spatially varying thermal transport problems in molecular dynamics.” Modelling and Simulation in Materials Science and Engineering (2010), 18:085007. (Jones) Jones, RE; Templeton, JA; Wagner, GJ; Olmsted, D; Modine, JA, “Electron transport enhanced molecular dynamics for metals and semi-metals.” International Journal for Numerical Methods in Engineering (2010), 83:940. (Templeton2011) Templeton, JA; Jones, RE; Lee, JW; Zimmerman, JA; Wong, BM, “A long-range electric field solver for molecular dynamics based on atomistic-to-continuum modeling.” Journal of Chemical Theory and Computation (2011), 7:1736. (Mandadapu) Mandadapu, KK; Templeton, JA; Lee, JW, “Polarization as a field variable from molecular dynamics simulations.” Journal of Chemical Physics (2013), 139:054115. Please refer to the standard finite element (FE) texts, e.g. T.J.R Hughes ” The finite element method “, Dover 2003, for the basics of FE simulation.